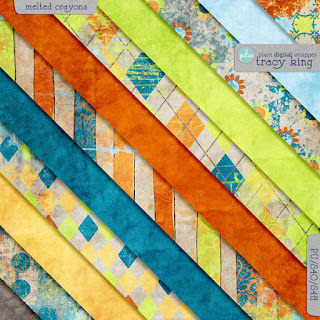 Today and the next few days I will be releasing one of my all time favorite kits for free!! I remember creating these papers and how much I love them. I made a bunch of layouts and printed them out, I print my own photo books. Seeing them again when I was going through the stuff on my hard drive made me smile so I decided that you should smile too!!! Click on preview to download and don't forget to come back tomorrow for more of this happy and bright kit! These are REALLY pretty. Can't wait to see the rest. Thank you so much for the compliment :). Next part is going up in a few minutes. Thanks a lot for sharing, beautiful papers! This is beautiful -- love the colors! Thank you for sharing it!! Thank you for sharing. These papers are gorgeous. I love this collection, Melted Crayons. I have a 7 year old son so there's sooo many things I can do with them. Looking over your blog I found the 2 paper packs- paper pack 2 and 3. I also have downloaded the journals and an element pack as well labeled elements 2 and 3. I cannot find paper pack 1 and elements 1. I don't know if these exist or it's just that I can't find them. Thank you for sharing the lovely papers.